With the new 1/48 Hasegawa and ICM Spitfire kits now firmly entrenched on the kit shelves, you should have at least one of these kits on your 'to build' pile. If you've already built one, that is no excuse as you need to do another! 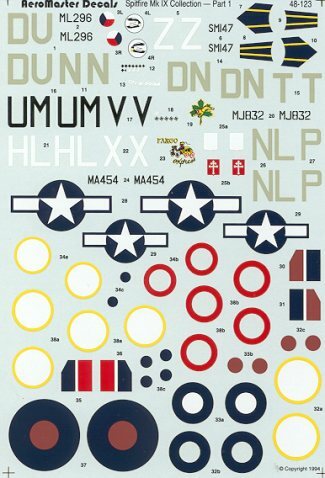 Probably the weakest part of both kits are their decal sheets. Not that they are bad, just uninspired. Well, as far back as 1995, the date on this sheet, there were quality markings available for the Spit XIII and IX, just not a kit to match them! This sheet has 6 different aircraft on it. Most of the differences are in code letters, though there are enough common markings to do three of them if you choose carefully. Next, a 416Sq IXc, this time from a Canadian unit and entitled 'City of Oshawa'. The 173 Squadron IXc is probably the most colorful of the lot as it retains its prewar marking of the dark blue and yellow sword blade. Since it served in the Med all of its war career, it did not get the squadron code letters so only an individual aircraft letter. The Mk IXb shown next is from 341 Free French Squadron so has French roundels on it. In all other ways it is quite normal. The US Mk VIII is from the 308 FS/ 31 FG in Italy, 1943. This reverse lend-lease aircraft is in the standard desert colors and is named 'Fargo Express'. 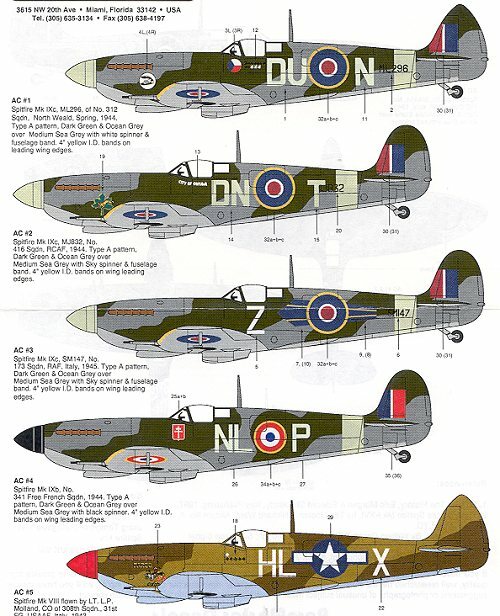 Not shown is a desert scheme IXc from 152 Squadron coded UM/V. It is quite unremarkable having only the squadron code letters to give it any individuality. There you have it. Six schemes for your next Spit. Now go out there and start building!! If you would like your product reviewed fairly and quickly by a site that averages over 100,000 visits a month, please contact me or see other details in the Note to Contributors.